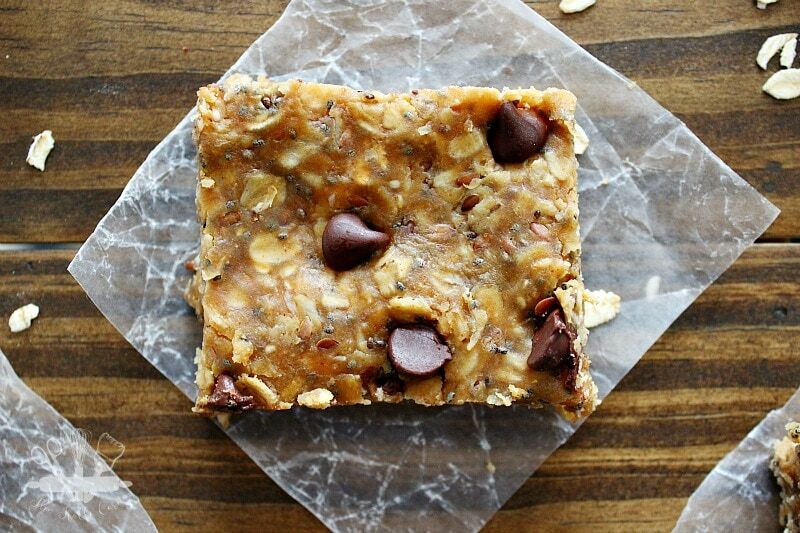 Here’s a recipe for no bake protein bars that are packed with enough protein to give your body the boost it needs, while satisfying the sweetness you crave. As I’ve mentioned a few times here, I am on a journey to eliminate added sugar from my diet and increase the amount of protein I’m eating. I have yet to cut out added sugars completely, but I have made a huge impact on my diet by just being aware of what ingredients are in the foods I consume. For instance, one of my favorite go to snacks used to be granola bars. I always assumed these were harmless snacks that would satisfy my sweets craving without being terrible for me. 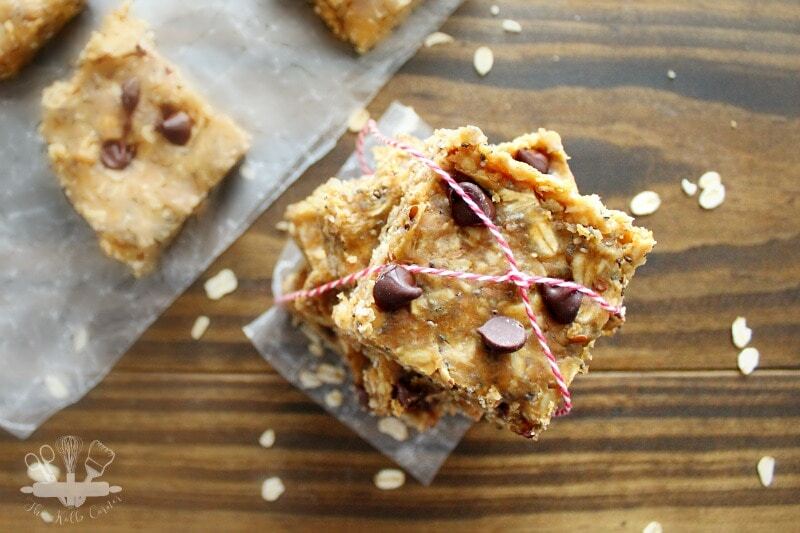 Have you read the ingredient list on some of these “healthy” bars? 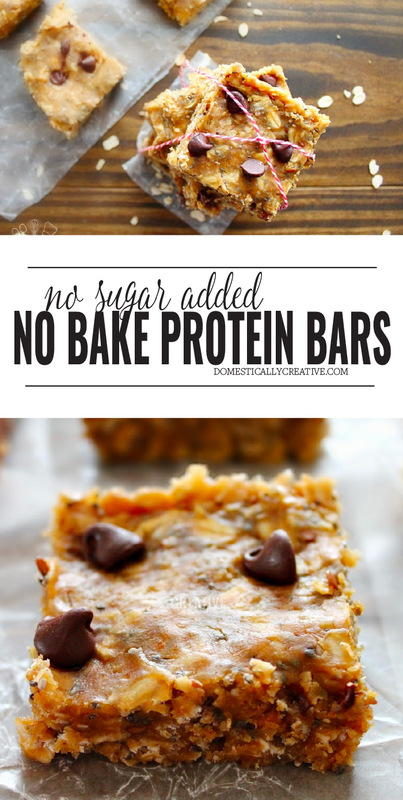 Most of them have upwards of 14g of ADDED sugar per bar. Ridiculous right? Then there are the bars that don’t have a lot of added sugar. Some of these are in the 3-6g of sugar range which is so much better. BUT, along with everything else that’s “good” for you these days, they come at a pretty steep price. We are talking over $1 per bar for some. So with all of that in mind, I decided to make my own. After browsing Pinterest for a good recipe, I decided to adapt a few to make my own. 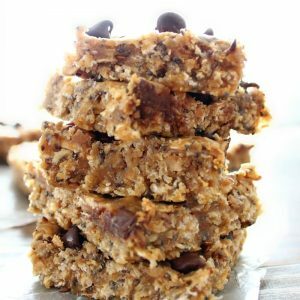 These no bake protein bars only have 3 grams of sugar (and the only “added” sugar is from the honey, which is a natural sweetener) and 16 grams of protein! That is an impressive amount of protein. 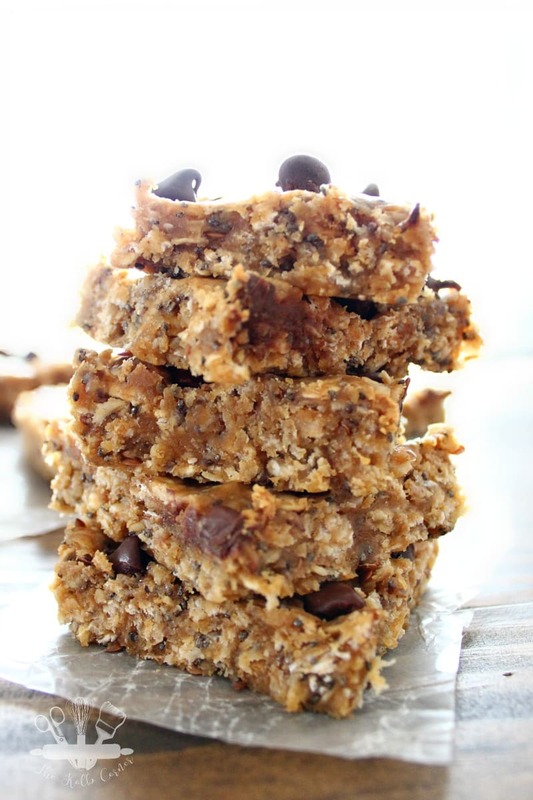 Plus these no bake protein bars are quick and easy to make! The hardest part is waiting for them to cool and harden before consuming. What’s even better, these bars cost roughly around $0.20 per bar. That more than 1/4 of the cost of those store bought bars! I call that a win. 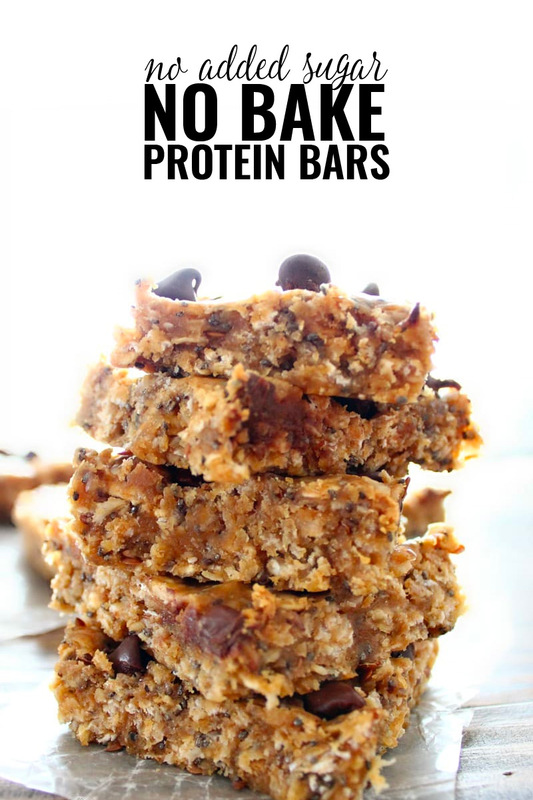 A chewy protein packed bar to give your body the boost of energy it needs, while satisfying the sweetness you crave.Here's a recipe for no bake protein bars that are packed with enough protein to give your body the boost it needs, while satisfying the sweetness you crave. In a medium bowl, toss old fashioned oats, flax seed and chia seeds with whey protein powder. Set aside. In a medium saucepan, combine milk, peanut butter and honey over low-medium heat. Stir until the peanut butter is melted and mixed well. Slowly fold in oat/seed mixture and stir until well combined. If using, sprinkle dark chocolate chips on top. Oh my, these look so delicious, I wish I could reach my hand through the screen and grab one. Hi there! You mention honey in the description of these but there’s no honey in the recipe…? Hi Lia! Thank you so much for catching that! So sorry. I added 2 tsp of honey. Do you add at the final mix-in step? Thank you for the response!! Yum! These would be a great easy breakfast when I’m on the go! I will have to try them. Yes you definitely need to try them! And they stick with you for a long time too! Hi Tracy! I left the chia and flax seeds whole. I left this sitting out almost 24 hours on the counter. It never occurred to me to refridgerate it, even though there is so much milk in it. Is this something I should have done!? Should I toss it?! Hi Jo! I’m so thrilled you tried my recipe. I do not refrigerate the bars after making them and I’ve never had an issue. Hi Erika! I cut mine into approximately 1×1 squares, but you can do whatever size you like. I used a 9×9 pan so I ended up with 9 bars. Hope this helps! Mine have turned out very chewy, is that right. They do have a chewy texture. I haven’t played around with it but I wonder if using a toasted oat or adding some granola in would make them more crunchy. Hi! I made these for my husband and they turned out great! I didn’t realize he still had them and ate one and it’s been 19 days since I made them, praying he doesn’t get sick. Future reference would love to know how long you keep them for. Tasha I’m glad he liked them!! I am honestly unsure how long they would keep in the fridge. When I make them they don’t last more than a few days lol. I hope he doesn’t get sick, but I’m sure he will be fine. These look absolutely delicious. Have you substituted almond milk before? I would like to try them with that. What about using a collagen powder instead of the whey protein? Hi Sydney. I haven’t tried either of those substitutions. I don’t think almond milk would make much of a difference in the consistency and would most likely add to the flavor (and protein content). As far as collagen powder, I am not familiar with it so I can’t say how it would affect the recipe. If you try either I would love to know! This looks good, but I have a nut allergy. Is there anything I can substitute for peanut butter? Thanks! Hi Jen! 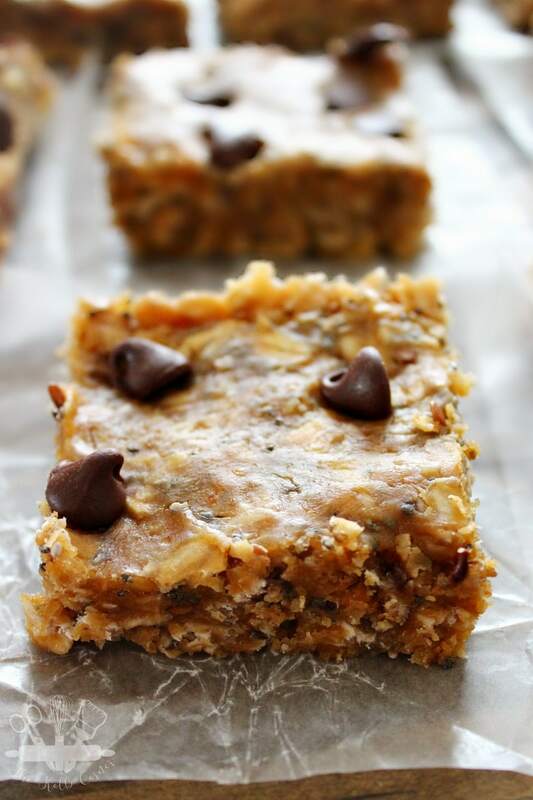 I’m not sure how sunflower seed or soynut butter would hold up in the recipe but if you try I would love to know how it works! I’m guessing I didn’t make these correctly as mine didn’t really hold together in the pan. They tasted awesome anyway. I wasn’t sure about the length of time it took for the peanut butter and milk to become creamy on the stovetop, but for me it was only a couple minutes. When I added the oatmeal mix, it wasn’t really warm so no cooling time was needed. Any insight as I really want to make these again as they are filling and delicious! Thanks for sharing. Thanks for this recipe! I adjusted a few things to make it low FODMAP and it worked well. I used unsweetened pea protein and only 1/2 a cup. I switched the honey for maple syrup and used about 4 tbsp. I used Lactaid for the milk and needed an extra few tbsp to get a moist texture. For chocolate chips I used Enjoylife brand and they tasted great! Oh yes, and a pinch of salt helped bring out the sweetness. My changes do decrease the protein a bit and obviously add more sugar but if you used the vanilla pea protein (trader joe’s) you might not need so much maple syrup. Thank you for sharing your adjustments Mary!